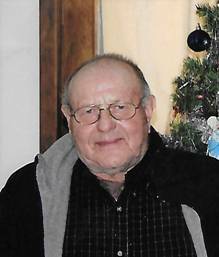 Rudy Wojiechowski, 85, of Karlstad, MN, died Monday, July 2, 2018 in Karlstad Healthcare Center. Rudolph “Rudy” Alvin Wojiechowski was born February 9, 1933, the son of Aloys and Julia (Strom) Wojiechowski at Ross, MN. He grew up in Roseau County. He served in the US Army from 1953 to 1955. He married Lorraine Kalinowski on October 22, 1956 at Blessed Sacrament Church in Greenbush. They lived in Greenbush and Roseau before moving to Karlstad in 1967. Rudy was a mechanic. While in Greenbush he worked for Einar Johnson service station. They operated Eastside Texaco in Roseau. He worked for Kapco in Karlstad, he operated Rudy’s Repair for many years and later he worked for Transystems as a mechanic. He also farmed. Rudy enjoyed hunting and fishing. He especially enjoyed working with his farm animals and he was an avid Minnesota Twins fan. 15 Grandchildren and 18 Great-grandchildren. Sister-in-law—Delores (Leroy) Taus of Strathcona, MN, & many other relatives and friends. He was preceded in death by his parents, wife—Lorraine on December 28, 1995, children—John, Colleen, Leonard, James and Joseph and grandsons—Austin Wojciechowski and Dylan Krolak. Funeral Services were held on Saturday, July 7 at 10:30 AM in Blessed Sacrament Catholic Church of Greenbush, with Father George Noel, officiating. Music was provided by many of Rudy’s friends, Elle Frislie was the song leader and Sarah Novacek was at the organ. Gift Bearers were Ralph & Sharon Kalinowski. The Reader was Stacy Penas. Eucharistic Ministers were Jan Burkel & Michelle Kern. Pallbearers were Ron & Bob Kalinowski, Lee Taus Jr., Alex & Max Pokrzywinski, Derrick, Adam, Justin & Brandon Wojciechowski, Joshua, Matt & Tom Carlson. All of Rudy’s Grandchildren were Honorary Pallbearers. Interment was in Blessed Sacrament Catholic Cemetery in Greenbush with Military Honors provided by the Halma-Lake Bronson Post 315, American Legion and the National Guard Military Honors Team. Arrangements were with Gieseke Funeral Chapel of Greenbush.